An important element to anyone’s “tool-chest for success” is building a positive mindset team. Are you familiar with this saying? Before you “poo-poo” this idea, stop and reflect a bit. It is a very powerful saying that is oh so true. Take a good, close look at who you are closest to in your life and without a doubt, you discover that you have very similar habits and lifestyle preferences, or you are at least on you’re way to matching them. It’s time to give some serious thought to who you surround yourself with don’t you think? 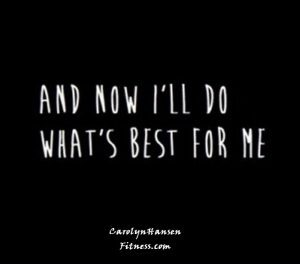 If you are trying to improve your overall lifestyle to a healthier you, for example, and you surround yourself with people who are not focused on maintaining a healthy lifestyle, but consistently make poor food choices concerning diet and never workout in any way, you’ve made your journey twice as hard as it needs to be! It’s much harder to maintain your healthy position when there is a tempting pizza right in front of you. Most people, if put in this position cave, and that’s why it’s essential that they distance themselves from anyone who is not on board with similar health goals, at least at the beginning of your journey, when you are more vulnerable to set-backs. If the people you surround yourself with are not mirroring what you want to have in your own personal life, you are just making things harder for yourself. This is why, when focused on changing your mindset from a negative to a more positive one, the very first thing that needs tending is to take a close, honest assessment of those who are around you. 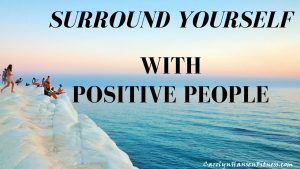 Are the people you are surrounding yourself with the ones who also maintain a positive mindset? Are these people consonantly looking for ways to improve themselves – ways to grow as an individuals? Are they involved with regular learning, regular action taking to improve their lives, and do they maintain a high degree of positivity on a day to day basis? Now, this does not mean that you should ditch your closest friends that may not be 100% positive. However, if you find that your five closest people aren’t the positive action-taker and go-getter’s that you want to become yourself, then you simply may want to consider how much time you spend around them and start looking to connect with other people that are more oriented in this manner. Remember, everyone, including you will go through some tough times when you just want to toss in the towel. Having positive people in yourlife, especially those who have been through similar situations, can help provide valuable tips and advice to make it easier for you. Start now to build a support team – these people can come from anywhere, even those you meet and converse with online count. Surround yourself with these people and then you will be seeing a major difference in how your feel and how you approach your own life. Pushing through hard times takes lots of courage, determination, resilience, patience and tenacity among other healthy virtues. Hard times are frustrating at best but everyone has to face them at some point. How you deal with them – as a victim or someone in control – determines whether or not your life is impacted in a positive or negative way. The best way to stay on track in any endeavor and come out ahead is to have a “game plan” in place before you begin that you can turn to, one that helps you push through and promote the proper positive mindset despite the “seemingly” worst kinds of circumstances that you might be confronted with in your journey. “Game-plan” is the keyword here. Your “game-plan” is essentially your “action plan.” Having an “action plan” in place helps to keep you moving forward – it gives you something to focus on and reach for. Start the process by thinking about what your situation is, where you currently are and where you would like to be going. What steps can I take that will move me in a positive direction towards my goal? Let’s face the truth, no one has ever created anything by sitting on a chair and thinking about it. Imagining something is the first step in the creative process, and a very powerful one, but it does not end there. You must take your creation from your creative “inner screen” of imagination to the outer world of form and you do that by taking action. Taking action lifts you out of “thinking/dwelling” on your situation – a passive bystander with little or no control – to one who takes action by putting forth solid effort to move themselves forward. When you feel in control of your destiny and your future – you also feel empowered. You’ve imagined writing a book. So, you wait and you wait for the right moment, but the right moment never comes. because, unfortunately, you’re trying to create from the outside in. That’s backwards. The correct process is to start writing your book, start moving the energy – and watch as the right moment reveals itself and the words begin to flow forth once you take action. 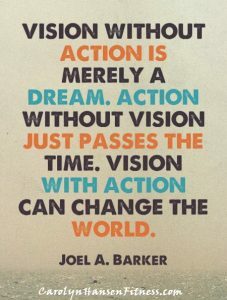 Connect your action step with your “inner vision” and watch as magic happens. Sit on the sidelines and wait for the “right moment” and your book never happens. It’s the action step that finishes the creative equation. 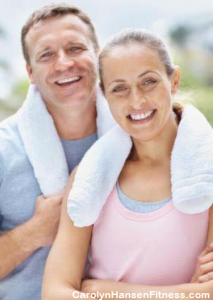 If you are having trouble sticking to your exercise routines or getting yourself to the gym, it might be time to indulge the help of a personal trainer to get you physically and mentally back on track. If emotional eating is an issue with you, seek help from a counselor that deals in those sorts of issues. Receiving help from experts, helps us to regain control and begin moving in the right direction quickly and efficiently. Most of all, remember that everything we do, provides a valuable lesson learned, information that we’ll use going forward. All experiences are learning experiences that help us to grow and become better individuals. Every experience should end by reflecting inward on what has been learned through the experience and how it can help you to further position yourself in the direction you want to go. The human mind is an amazing tool. It generates both positive and negative thoughts and there is always a conflict between them. 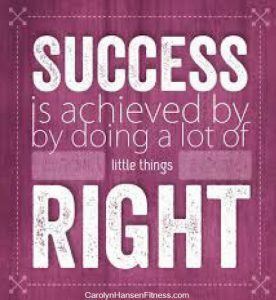 What wins out is shown through our actions and behavior towards things. If our mind is full of positive ideas on dealing with everyday life, our way of thinking also becomes positive, if it is full of negative thinking then that is what plays out. We can define the term “positive” as confident, optimistic and focused on good things as opposed to bad things. Therefore, positive thoughts are those that bring confidence, optimism and focus to us as an individual. Positive thought breeds a positive outlook in life. 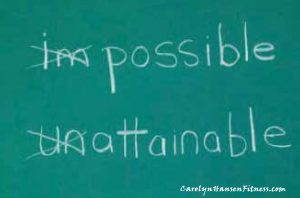 Simple “I can’s and I am’s” are the perfect way to start cultivating a mind filled with positive thoughts. Negative is the opposite of positive. You could define it as “being pessimistic or tending to have an undesirable outlook.” These types of “mind thoughts” are nonconstructive ideas that discourage us from being someone or doing something. They pull us down so we are unlikely to believe in ourselves or in what we do and achieve. 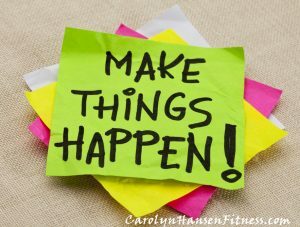 When we formulate limiting beliefs about what is possible for us to accomplish, our response is to limit and bind any actions we take. As a result, the results we experience are limited. Negative thoughts are evil and many times observable on the faces of people entertaining them. No, not, don’t, can’t, won’t and what ifs are all types of negative thinking that destroy rather than create. These types of limited thoughts hold you back and build a wall between you and your goals. They keep you from doing something without even trying. Truth is, our minds our boundless when it comes to generating thoughts. When an issue occurs, it immediately goes to work making a list of all possible solutions, regardless of whether they are acceptable or unacceptable or even possible. It’s at this point of disturbance that the clash begins. The positive thought “yes, I can” and the negative thought “no, I can’t” compete. The accepted and prized thought is what then moves into action. If our belief is that we are likely to fail, then the subconscious gets to work producing actions that support this belief. On the flip side, when we trust we’re going to succeed then then our subconscious goes to work setting the table for success. It is our actions that speak loud and clear and reveal what kind of thoughts have been dominating our minds. These are the thoughts we carry around and entertain on a daily basis. If there is something that needs working out, it is not our actions that need tending to first…but our thoughts which lead to those actions. We must get life working for us. Since all our behavior results from the thoughts that precede it, our focus should not be on the “behavior” exhibited but the thing that is causing this behavior…our thoughts. Both positive and negative thinking have power over us. It’s entirely up to us which one we choose to empower us since both shape our future and create out destiny…just bringing different results. Always keep in mind the fact that your thoughts are more important than the actions you take. If you keep yourself in a constant positive frame of mind, you will be able to keep your motivation to achieve optimal health strong and resilient. With strong motivation behind you, achieving your goals becomes much easier. Motivation is a magical energy. It is literally the “desire” to do something. The energy that pushes us forward. It can take us from no action to intense action in a split second it’s that powerful. It ebbs and flows like any other energy. Some days it feels more easily “on than others. The crucial element in setting and reaching goals is without a doubt, motivation. Lack this empowered feeling and what should be “ten pounds of weight” towards reaching a goal turns into an easy “fifty pounds” of heavy lifting. The good news is, no one is permanently attached to any level of motivation they currently have. 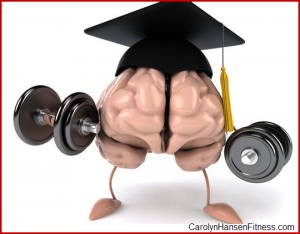 Research shows you are empowered and can influence your own levels of motivation and self-control. There are creative tools you can use that will help boost your motivational levels so you can enjoy greater levels of success. If you don’t currently enjoy a circle of at least five people that you can surround yourself with that support and share your health and fitness goals, it’s time for you to actively find some. Surrounding yourself with people who are committed to leading active lifestyles will have a very positive effect at keeping you focused and committed towards your own health and fitness goals. Nearly all cities and large towns have fitness minded groups you can join. You can get together and enjoy fitness minded ventures as you socialize. It’s a win-win situation. If running is something you enjoy, enroll yourself in a race/event of some sort. If it’s swimming or walking, look for like-minded events. There are numerous kinds of races available now so finding one that meets your specific interests should not be that hard. Challenging yourself with a race will also provide you an alternate purpose for training. 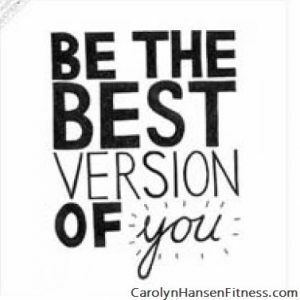 You won’t be doing it just to look and feel better but to achieve satisfactory results in your race. If your goals are not formulated properly, it will be much harder to reach them. Consider using the SMART goal setting process. SMART goals are: specific, measurable, attainable, and relevant and have a specific timeline in place. If your goal dos not satisfy these requirements then it’s time to set a new goal for yourself. Make sure you continually reevaluate your goals as you make progress. Every 6-8 weeks take time to update them and adjust them to what’s most important in your life right now. Keeping track of your progress in one form or another – pictures or journaling is the perfect avenue) and mandatory for motivational success. 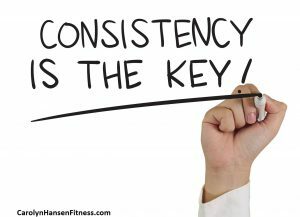 By writing down or documenting in some way the reps, sets, weight and so on that you do each day at the gym, you’ll have important tangible evidence that you are in fact getting stronger each time and moving closer to your goal. This becomes the perfect inspirational tool to embrace on days when you feel as though you are not making the progress you hoped for. 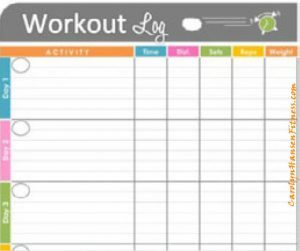 Use a workout log for writing your workouts down. Make sure you are taking the time to try new activities as you move through your exercise program. Try a new form of cardio training, possibly something you’ve never done before. Or, simply add some new strength training moves to your current workout routine. Whatever you choose…change is good. Remember, motivational levels ebb and flow…they come and go. This is natural and even the most motivated person will experience days when they cannot seem to “get motivated.” That’s all normal and fine. However, if your motivation starts to slip for days on end, you’ll need to take serious steps to get it back on track again. Both are powerful sayings that are very true. If you take a look at who is closest to you in your life, you will come to find that you have very similar habits and lifestyle preferences as they do, if not immediately then you’re likely on your way to matching their energy and choices in the near future. And, that’s why it’s ultimately important that you give serious thought to who you surround yourself with and exchange energy with. If those that you currently fill your life and time with are not mirroring what you want to manifest in your own personal life then you are just making things harder for yourself. Sort of like trying to “swim up-stream” against the tide. 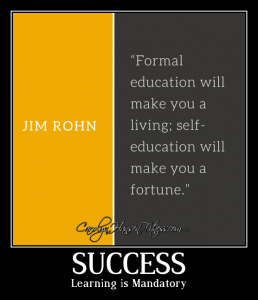 Successful entrepreneurs know this. They are positive people who surround themselves with people who are also positive by nature and positive about their lives and careers, those who bolster and boost that good feeling rather than destroy it. Truth is, when focused on shifting your mindset from one focused on the negative to one focused on the positive the very first thing you need to address is your own environment and those you are sharing your time and energy with. Are they taking regular consistent actions that improve their lives? Are they actively learning and do they maintain a high degree of positivity on a day to day basis? If the answer to these questions is no, you’ll be in for a much harder journey ahead. Understand, this isn’t about ditching friends that are not 100 percent positive, it’s about searching out those that are extreme, that drag you down and doing something about it. Always focus on the good that people bring into your life…focus on how you feel when you are with them. If the energy shifts to “negative” then you may want to consider how much future time you spend around them. You may want to start looking for new connections, those who’s positive attitude and energy help keep you lifted, confident and feeling good about yourself. There are infinite amount of groups or classes available locally to most people where they can meet others who share interests, a similar frame of mind and are striving towards similar goals. The reality is, anytime you are sharing “space” with someone else you are also exchanging energy. So, position yourself for better success by surrounding yourself with those who also desire that. At the same time, you’ll also be building a strong support team around you for when “harder times” hit and you need a bit of a lift. These people can come from anywhere…they might be your personal trainer, someone you are sharing a class with, a family member or close friend or even an online forum, as long as they represent and possess precisely what it is that you are looking for in your own self they will nurture those qualities in you.